Both the training and knowledge test courses for the 13 tasks listed below are scheduled to undergo maintenance (26 courses total). The courses will be offline beginning Saturday morning (June 30) at 7:00 a.m. CST. We expect maintenance to be completed by Monday morning (July 2) at 10:00 a.m. CST. A blog post will go out when maintenance is complete. Both the TNG and KNT for each covered task will be updated. The 12 courses listed below are scheduled to undergo maintenance. The courses will be offline beginning Saturday morning (June 23) at 7:00 a.m. CST. We expect maintenance to be completed by Sunday morning (June 24) at 10:00 a.m. CST. A blog post will go out when maintenance is complete. The course listed below is scheduled to undergo maintenance. The course will be offline beginning Wednesday evening (June 20) at 6:00 p.m. CST. We expect maintenance to be completed by Thursday morning (June 21) at 10:00 a.m. CST. A blog post will go out when maintenance is complete. There is a lot going on in Rochester, MN August 13-16, 2018. This one-day event covers evaluation theory and best practices, offers extensive discussion, and provides hands-on practice for conducting credible performance evaluations. This one-day event features topics specific to Operator Qualification (OQ), compliance, and technical training. Sessions include OQ standards, national portability, records management, safety, regulations, and the next generation of gas workers. Attendees will also have an opportunity to see MEA’s new compliance and recordkeeping system. 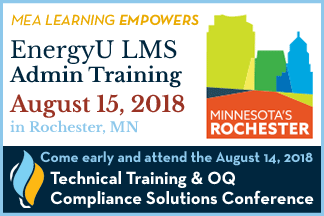 This one-day event will ensure EnergyU LMS Administrators understand how to navigate the learning management system, perform specific tasks critical to the maintenance of individual and company online training and testing records. This annual event provides numerous networking opportunities for natural gas crews, foremen, supervisors, managers, and directors. The summit features keynotes, exhibits, and pre-conference courses. Tracks include compliance, safety, measurement and control, distribution and technology, engineering and technical training. Visit the MEA events calendar for more information or to register. Discounts apply when attending EnergyU LMS Administrator Training in conjunction with Train the Evaluator. Discounts also apply when attending the Technical Training and OQ Compliance Solutions Conference in conjunction with Train the Evaluator or the Gas Operations Technical and Leadership Summit. Meet in Rochester. Home of the Mayo Clinic, Rochester has scenic beauty and tranquil charm. Rochester is easy to get to. The Rochester International Airport is a friendly and welcoming airport that serves many direct and connecting flights. Daily shuttle service is also available from the Minneapolis-St. Paul Airport. In addition, these updated courses will also have the new knowledge test functionality. Course users will only be allowed to open a KNT course once. If a course session is ended for any reason prior to receiving a passed or failed score, the status will change to “In Progress” and the EnergyU Administrator will be required to reset the course. Users will not be able to launch an “In Progress” knowledge test until the course is reset.